Asian stocks were modestly higher Friday, but worries about tighter government policies sent China's markets lower for a second day. Trade across the region was quiet, with many investors out for summer holidays or waiting for more clues about the strength of recovery in the global economy following the worst downturn in decades. Oil prices rose moderately, as did the dollar against the yen. Investors were hopeful about prospects for Asian exports after a U.S. government report showed the economy shrank at a 1 percent annualized rate in the second quarter. While unchanged from a preliminary reading on gross domestic product, the updated figure was better than the expected 1.5 percent decline and added to evidence the world's largest economy was turning around. However, gains were capped by fears about China's measures to prevent the economy from overheating after loose banking policies and frenetic stimulus spending unleashed enormous liquidity that's helped lift regional markets since March. "Investors are still worried about the policies in China," said Marcus Au, a market analyst at Tanrich Financial in Hong Kong. "After helping the markets for months the China story is now starting to weigh on sentiment." 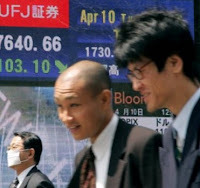 Japan's Nikkei 225 stock average rose 25.93, or 0.3 percent, to 10,499.90 despite news that Japan's unemployment rate rose to an all-time high in July and prices fell at a record pace — both threatening to dull the economy's recovery. In China, the Shanghai benchmark dove 2.8 percent to 2,864.37, and Hong Kong's Hang Seng was off 0.5 percent at 20,144.32. Korea's Kospi was up 0.2 percent, India's Senses added 0.2 percent, Australia's main index rose 0.6 percent and Taiwan's market gained 1.2 percent. Overnight on Wall Street, the Dow rose 37.11, or 0.4 percent, to close at 9,580.63. The benchmark has advanced for eight straight days, rising 445 points, or 4.9 percent. The Standard & Poor's 500 index rose 2.86, or 0.3 percent, to 1,030.98, while the Nasdaq composite index rose 3.30, or 0.2 percent, to 2,027.73. U.S. futures pointed to a weaker open Friday on Wall Street. Dow futures were down 15, or 0.2 percent, to 9,552. Benchmark crude for October delivery added 4 cents to $72.53, extending a $1.06 gain overnight. The dollar rose to 93.68 yen from 93.49 yen. The euro was slightly higher at $1.4360.